Our builder is back today, finishing up (we hope) the last bit of work before the room is absolutely complete (no pix till it’s perfect). The bedroom is definitely the smallest one I’ve ever had in a home — just wide enough for our queen size bed plus one small chair. But I think it’s the perfect size for us — we love it. And we’ve even included some kitschy 50s-style touches to make it completely our own. 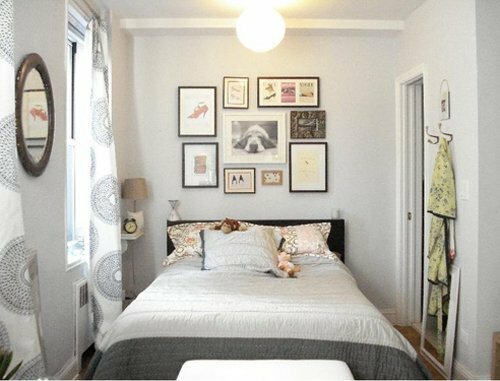 I’ve always known that other people have small bedrooms, and I’ve wondered how they managed. 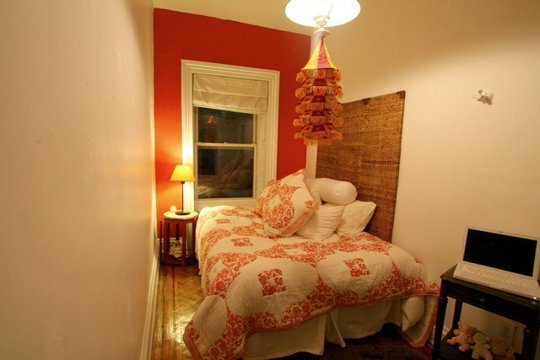 So off to Apartment Therapy to look at what others have done with their tiny sleeping rooms. First, some parameters, I was interested in areas that could sleep two adults — I know you can tuck a child’s crib into any corner, but that wasn’t going to help me. Plus, it had to be set off from the main living space in some way, not just part of a studio apartment. And I found some real winners — and inspiration. This all-white room still manages to get that punch of colour with the wall-papered back wall. And the kitchen cupboards set high bring in more storage while not intruding. 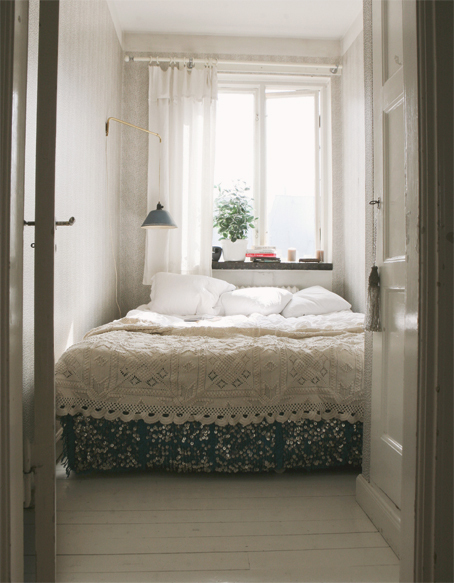 This all-white room grounds itself with the darker bedskirt — and brings texture in with that lovely heirloom coverlet. This room is really tiny, but the high ceiling could make you think you’re sleeping in the bottom of a box! It’s the light walls and minimal textures (just the brick wall) that make it a comfortable space. By keeping the accessories in this room light and bright it manages to look cute but not cluttered. And the shelf beside the bed means no need for a nightstand (spoiler alert–that’s what we did in our room). 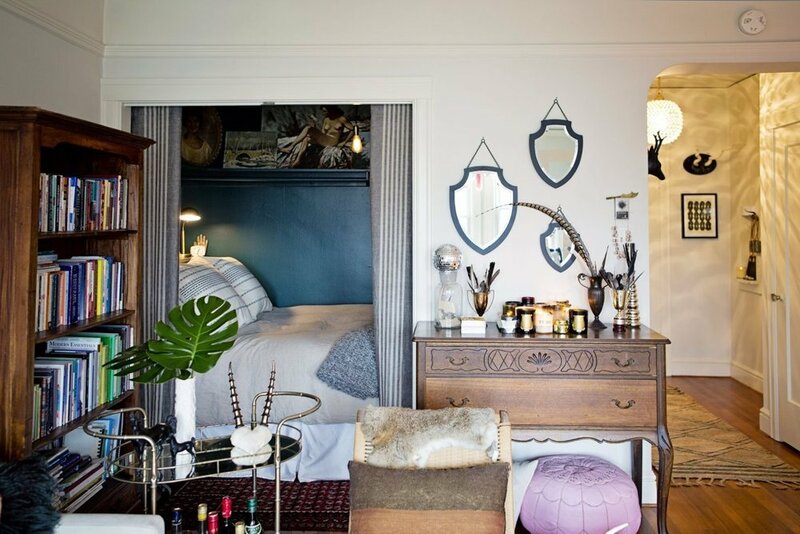 But just because a bedroom is eensy doesn’t mean it can’t be dark and dramatic. 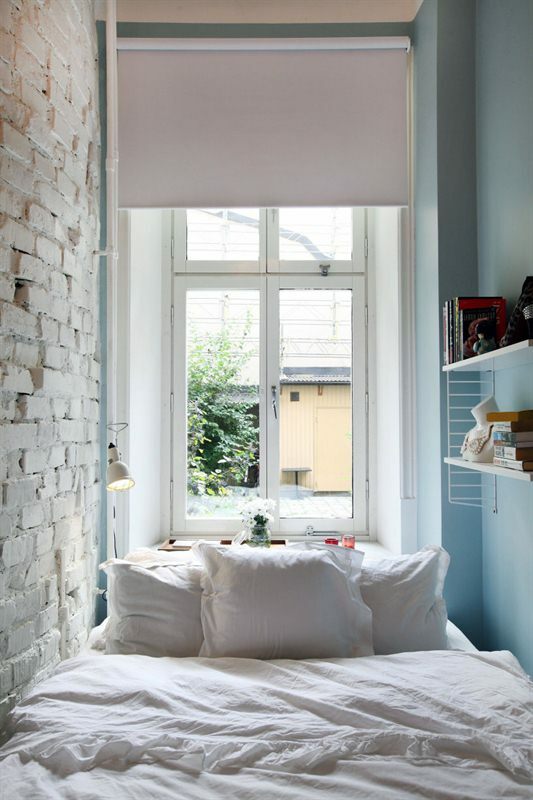 This narrow room has the bed pushed against one wall as we’ve seen in some of the other rooms, and thus has gained space for an unobtrusive night table. But it’s that bright pop of wall colour repeated in the coverlet and that dramatic light fixture that makes it special. 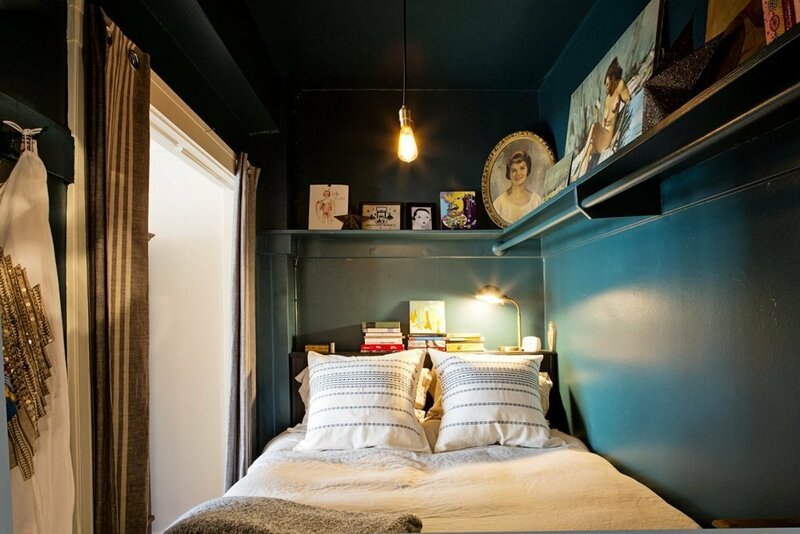 The dark colours in the wall really bring the drama to this small bedroom. 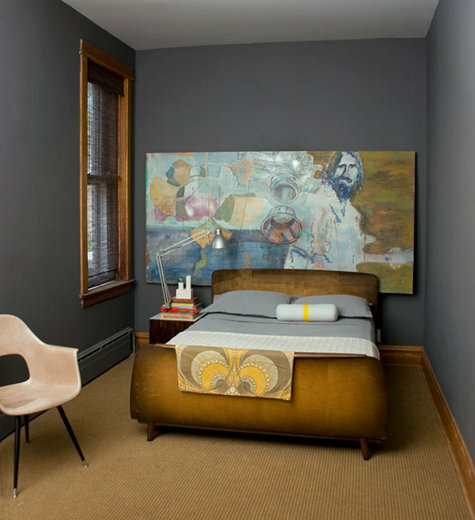 Very clever use of colour, see how the ombre wood of the bed is picked up in the mustard tones of the wall-sized painting? Plus the little punch around the white pillow also picked up in the quilt hanging over the foot of the bed. Even the window trim is that same tone. Very clever. And as we have seen, even the smallest spaces can be dramatic. Glossy wall paint reflects the overhead bulb and the wall-mounted bed lamp. Lots of ideas that show that clever always trumps large when it comes to decorating — and small is beautiful. Posted in Decorating, Laneway House, Small House and tagged Decor, Lane Home, Lane house, Laneway House, Small Style. Bookmark the permalink.